Even if you have model-like proportions, trying on clothes can be an irritating and stressful activity. Pushy salespeople and annoying fellow shoppers tend to put a damper on the whole experience. 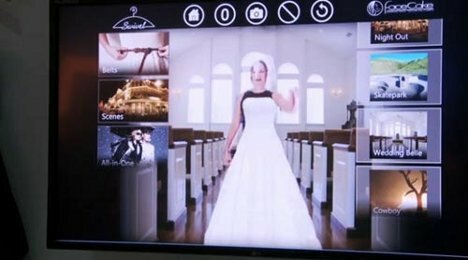 A California company called FaceCake has just made trying on clothes a lot more fun by letting you do it from the privacy of your own home, video-game style. 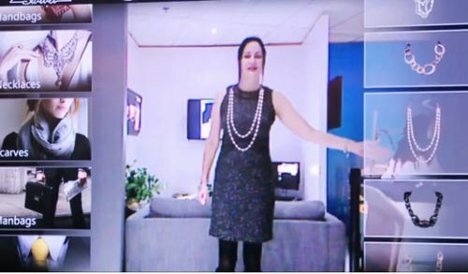 Using a setup built around the Microsoft Kinect and a live webcam feed, the Swivel system projects the user’s image onto his or her own screen. The available product categories appear in lists on the sides of the screen so customers can use hand gestures to select products that interest them. The clothing, accessories and jewelry are digitally overlaid on the image of the customer. The items would fit realistically, taking the customer’s body shape into account. 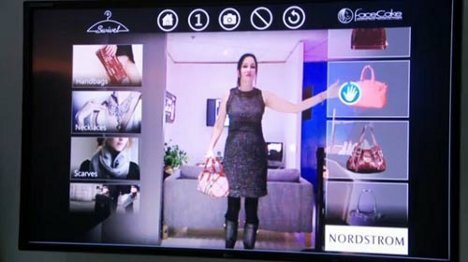 Shoppers can even turn around to see how clothes would look from the sides and change the on-screen background to see how the look would work in the real world. Swivel will make recommendations on outfits and even let shoppers take snapshots of different looks to send to friends and family – because what guy doesn’t want to get a bunch of pictures of his girlfriend in 30 different virtual outfits? See more in Futuristic or under Technology. January, 2012.